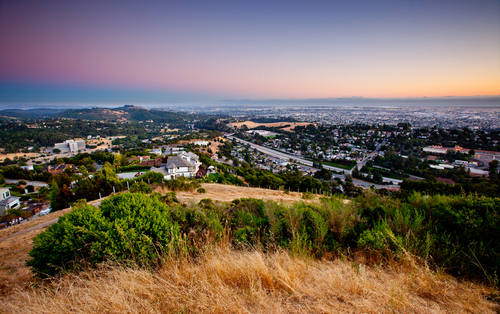 The Oakland Hills is not actually an official term, but rather a popular description for a section of residential neighborhoods in the Berkeley Hills Range situated on the Eastern side of Oakland, California. The highest elevations in the City are here. It includes the Northeast Hills communities of Claremont, Forestland, Glen Highlands, Hiller Highlands, Lake Temescal, Merriwood, Montclair, Piedmont Pines, Oakmore, Joaquin Miller Park, Sequoyah Heights, Shepherd Canyon, Upper Rockridge and Panoramic Hill. You will find larger family homes with spacious yards and residents with higher household incomes, lower unemployment rates, and historically lower crime rates as opposed to the flatlands of Oakland which feature smaller homes and lower income demographics. The higher one goes in the hills, the more impressive the homes become with many mansions perched on the hillsides taking in enormous San Francisco Bay views. The Caldecott tunnel passes right through the Oakland Hills, though this isn't the official designation for its' location! The Oakland Hills lie East of Route 13 and I-580 South at it's junction with Route 13. Schools to consider in the Oakland Hills are: (For further public school information visit the Oakland Unified School District School Finder. For private school information visit Private School Finder.